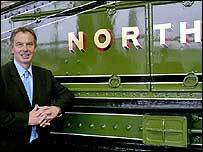 Britain's newest railway museum is redrafting plans for 2005 after becoming a victim of its own success. 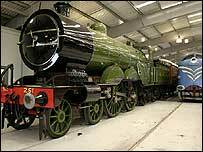 Locomotion: The National Railway Museum in Shildon, County Durham, is based at the first departure point of the Stockton and Darlington Railway. Opened in October by Prime Minister Tony Blair, it was hoping to attract 60,000 visitors in its first year. But organisers say more than 70,000 people passed through the museum's doors in the first two months alone. Plans for 2005 are being redrafted to accommodate the expected continued increase in visitor numbers. Museum's manager George Muirhead said: "It's been a real rollercoaster. "We never really expected so many visitors in our first two months. It's absolutely fantastic. "We were originally very conservative in our visitor figures. But now we're looking at about 100,000 visitors for 2005. "I think we have captured the imaginations of a lot of people, especially children. "We have a lot of locomotives on show here that you cannot see anywhere else." The museum is home to 60 historic carriages from the national collection, along with a "living workshop" where local apprentices will be trained to restore and conserve trains and engines. The site also recycles rainwater for use in steam locomotives. The project received £2m from the European Regional Development Fund as well as grant aid from a number of regional and national funding bodies, including development agency One NorthEast. It is part of a £70m government funding deal for museums across the country. Mr Muirhead added: "It's always hard work after the initial surge of visitors, but we have a lot of things planned for visitors over the coming year. "We will constantly be changing the exhibition to keep things fresh for visitors. "One of the high points will be the replica of George Stephenson's Rocket, which we will have steaming in the New Year."